Each year, there’s a new haunted house or corn maze that boasts about being more horrifying and gruesome than anything previously seen. Yawn. All that bragging can really drive home the sad fact, that Halloween gets less and less exciting as we grow older. Because instead of getting sugary treats for simply being cute and wearing fangs or bed sheets, now we just wind up shelling out for an expensive night of belligerent, costumed tomfoolery. This year at Greenside, we know which apparitional abode will instill fear into even the most ghoul-obsessed grown up; prepare to be scared at Harvest: Seattle’s Premier Adults-Only Haunted House. This interactive display is directed by the Seattle Immersive Theater, and it’s not for the fainthearted. Seriously, you have to sign a waiver. To experience a night of THC and terror, stop by Greenside Recreational before you hit this spooky spot for a bit of cannabis to heighten the senses and make it an unforgettable fright night. Reminiscing on the old days of candy and costume compliments? 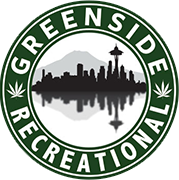 Greenside carries HONU Peanut Butter Cups which taste just as good as the original counterpart, with an added infusion of THC. These cannabis cups are as potent as they are pleasing to the tongue, with a full recreational dose of the psychoactive molecule in each little morsel. The ladies tend to wear less clothing on All Hallow’s Eve, so if you fall into that category, the extra calories probably do not sound to appealing; instead of a reefer Reese’s, try a Sour Apple Cavicone. Caviar Gold is a luxury cannabis company known for their premium kief and concentrate filled pre-rolls. A few puffs off of a Cavicone and the cadaverous actors at the Seattle Immersive Theater will look more undead than ever. Whatever pot products you choose for this eerie adventure, make sure you pick them up at Greenside Recreational. Our budtenders will have plenty of recommendations to keep you high at this haunted attraction. Harvest runs Thursday to Sunday, through October 31st. Get your tickets here—if you dare!